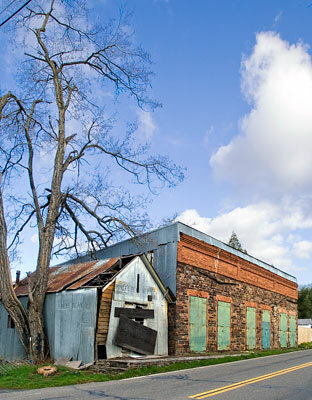 The Gamble Building is one of the oldest buildings in Tuolumne County and continuously served Big Oak Flat from the 1850s until the 1930s. It is one of the finest examples of Gold Rush stone commercial architecture to be seen today, displaying splendid craftsmanship, with solidly constructed native slate stone walls accented by brick lined doorways and brick frieze. Located to the rear of the Gamble Building on the west side is a small stone and adobe room which served for a time as the community's jail. When Big Oak Flat burned in 1863, only two buildings survived: the Gamble Building and the Odd Fellows Hall which is similarly constructed. The wood frame building, known as the Miner's Bean Kettle since the 1920s, was built around 1870. It is one of only three wood frame buildings in Big Oak Flat built prior to the 1890s. The building has had few changes since its erection - chiefly the addition of corrugated metal siding and roofing - and provides insight into the simple but efficient commercial architecture of the 1870s. This building served as a residence and business facility until the 1940s. By 1852 upwards of 3,000 people lived in and around the Big Oak Flat area. A sizable collection of permanent buildings soon surrounded the Gamble Building, including hotels, boarding houses, livery stables, restaurants and, of course, saloons. About a dozen of these buildings were constructed of stone or adobe, the rest were wood frame. Only a few buildings came near in size and value to Gamble's, none surpassed it. The Gamble Building was an impressive architectural achievement with its fourteen foot high stone walls and brick detailing across the front. The stone and brick were obtained locally but the huge iron fire doors were reportedly packed in via mules. From the 1850's until 1893, the Gamble Building housed a Wells Fargo Office. Adapted from the NRHP nomination dated 16 November 1990.